Many of us treat our car like a second home. Whether it’s a vintage Mustang or a modern Civic, the idea of spending a Sunday afternoon polishing the body work, checking the exhaust, or inspecting tire tread depth, seems like heaven to some. Especially with sites selling all sorts of car parts and accessories online, the length some go to maintain their vehicles isn’t far off wishing they could live in them. And weirdly enough, it appears one man in California did just that. In an attempt to reduce his living expenses and pay back student loan debts, a 23-year-old named Brandon decided that he’d had enough of paying exorbitant prices for rent in San Francisco, and instead bought himself a large Ford truck to live in. An employee at Google, Brandon was paying around $2,000 per month on housing costs, yet was dismayed at the amount it was costing him. Being the frugal man he was, Brandon bought the truck up front for $10,000, knowing that he would save so much more income in the long run. 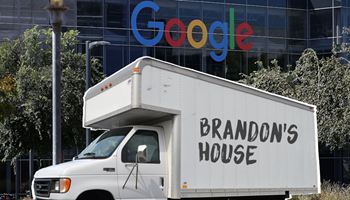 By converting the truck’s cargo area into a makeshift bedroom, and additionally parking in Google’s employee carpark, Brandon’s new home is mere minutes away from his place of work. Furthermore, Brandon uses the company’s kitchen and bathroom facilities, doesn’t use any electricity, and his phone is payed for by Google. Though what this particular lifestyle loses in comfort (heating, air-con, bathroom, and well…not exactly having a bachelor pad), more than makes up for in convenience and character-building. The young man’s determination to save money to pay off debt is remarkable, and shows a great example to those who say that they are struggling with debt. With study loans being a constant problem around the world, Brandon’s method is representative in successfully stepping over the student funding minefield, as he actually brought down $22,434 to $16,449 in only four months. If he can do it, anyone can. Good for him. Make the most of what you have while you can. That lifestyle won’t scale for a serious relationship let alone a family, but it’s fine for a young workaholic bachelor. I have a nephew who has moved into a camper-van in SoCal so they can free themselves from high rents and live a more minimalist lifestyle. Their biggest issue is finding somewhere to park Safely over night. Brandon being able to park in his job’s (Google)secure parking lot and have access to a kitchen and bathroom makes his decision a very smart one. When a lot of us had to relocate to just outside Denver CO in 1995 to keep our jobs there were a few folks who brought down their RVs and spent the initial 5 warm months living in the parking lot. It was a great deal for them. I was wishing I had an RV back then.